The flexible spout rotates down more than 180 degrees and fits perfectly into any machines fill location while the thumb release trigger on top controls the flow. By pulling straight back on the safety trigger and then down on the thumb button fuel is released immediately while you stay in complete control the entire time. When you notice your fill tank is almost full slowly release the thumb button and allow the excess fuel to drain from the top of the spout before rotating it back up. No more busting your back to get the fuel you need to run your program! Prevent Tearing. New full pull tab design for easy removal. Made of 1000 denier Cordura nylon material. Developed by Dupont, this is the same material used in United States military gear. Don't be mislead by others claiming denier of a lesser count or some who bill out Condura instead of Cordura. These covers are simply one of the best covers you can put on your car. These Jr dragster tire covers are extra wide and are USA designed and developed for maximum protection and life. 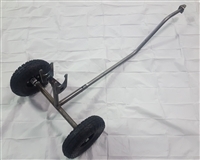 Jr dragster cradle for those who want to maximize your tire's lifetime!